You may have many questions about your surgical procedure. How will my doctor decide whether I need surgery? Will I need to stay overnight in the hospital? What type of anesthesia will the surgeon use? Dr Matthew Johnson and the entire staff at Desert Surgical Associates are available to answer your questions. Dr. Matthew Johnson is a very compassionate surgeon that always takes extra time when communicating with his patients as well as their families regarding their care. He is driven, kind, and extremely innovative in the field of surgery. He is also one of the few surgical endoscopists in the country. In 2011, as a chief resident, he received the Professionalism Award at the University of Nevada School of Medicine and continues to emphasize this professionalism throughout his surgical practice. He is very well respected by his colleagues in the field and always strives for perfection. Dr. Johnson did his undergraduate training at the University of Texas at Austin and is a faithful Texas Longhorn to this day. He subsequently attained his Medical Doctorate at the American University of the Caribbean, in St. Maarten, N.A. where he also attained a Masters in Medical Science (M.M.S.). Dr. Johnson’s residency training was completed at the University of Nevada School of Medicine, Las Vegas, NV in General Surgery (2005-11). He then went on to become one of the early fellows in the country to complete an Acute Care Surgery fellowship at the University of Nevada School of Medicine, Las Vegas, NV (2011-13). During his residency and fellowship, Dr. Johnson also trained in Surgical Endoscopy with a specific emphasis on both diagnostic & therapeutic ERCP. In fact, along with other colleagues, he developed a new method for treating obstructing complicated biliary disease using combined cholecystectomy and ERCP in a one stage procedure, so-called the “One-Step/ELBS”. Throughout residency and fellowship, Dr. Johnson presented at many national conferences regarding ERCP use by surgeons for trauma and general surgery in addition to authoring several publications. Following post-graduate training, Dr. Johnson joined Desert Surgical Associates and hit the ground running. He cares for patients in the field of general surgery, minimally invasive surgery, trauma, and critical care. Dr. Johnson’s specific interests involve minimally invasive robotic surgery, advancement of minimally invasive surgery in trauma patients, foregut surgery, hepatobiliary surgery and the use of ERCP for both diagnostic and therapeutic measures. Faster recovery time and return to normal activities. Smaller incisions, resulting in reduced risk of infection. Reduced blood loss and transfusions. 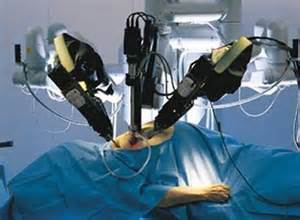 Medical historians disagree on which was the first robot for medical use and when the first robot-assisted surgery took place. Some say the first was the “Arthrobot”, which was developed and used for the first time in Vancouver, BC, Canada in 1983. Others say the first documented use of a robot to assist with a surgical procedure occurred in 1985 when the PUMA 560 was used with CT scan to place a needle for a neurosurgical biopsy. They can agree on one thing about its history, though; the robotic system offered greater precision and successful outcomes. This led to the first robot-assisted laparoscopic procedure in 1987. Experts continued to improve on these surgery-enhancing robotic machines over the next 20 years, and in 2000, the da Vinci robot became the first complete robotic surgical system to be approved by the FDA for general laparoscopic surgery. Since then, the list of procedures performed laparoscopically with robot assistance has grown at a pace consistent with improvements in technology and the technical skill of surgeons. Now daVinci is used frequently around the world for performing bariatric and gastrointestinal surgery, cardiothoracic surgery, ear, nose and throat surgery, gynecological surgery, and even pediatric surgery, among others. Surgeons, patients, and insurance companies agree that minimally invasive, robot-assisted surgery offers great benefits over traditional open surgery. Incisions are smaller, so procedures leave little to no scars. The risk of infection is less, hospital stays are shorter, if necessary at all, and convalescence is significantly reduced. Many studies have shown that laparoscopic procedures result in decreased hospital stays, a quicker return to the workforce, decreased pain, and better postoperative immune function. If you think you might be a candidate for robotic surgery, schedule a consultation with Dr. Johnson, a Las Vegas board-certified robotic surgeon.